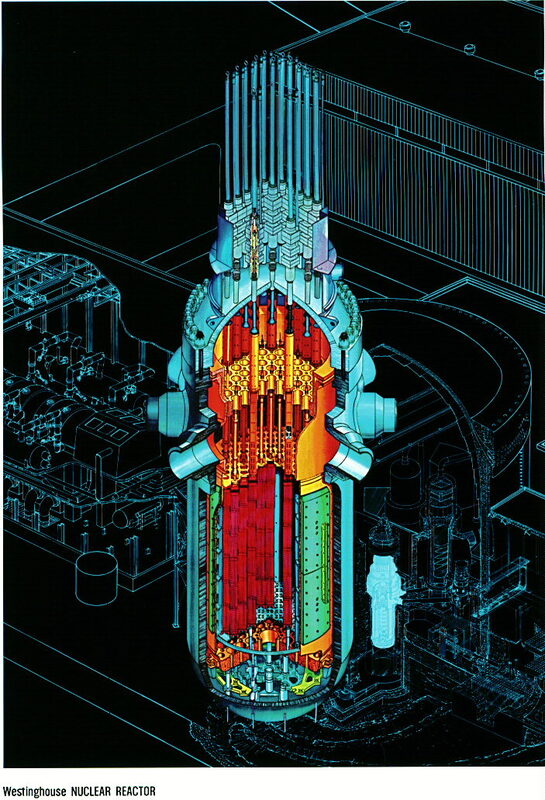 The figure to the left illustrates the reactor vessel. The green and orange colored core barrel sits within the reactor vessel. Water enters from the cold leg nozzles, flows downward in the space between the core barrel and the reactor vessel, then flows upward through holes in the bottom support plate on which the fuel assemblies stand. The water flows along the fuel assembly, out the top support plate, then into the upper plenum of the reactor. From there, the water flows out one of the hot leg nozzles. The protrusions on top hemispherical head of the reactor are the control rod drive mechanisms (CRDMs) and position indicating devices. The actual control rods are inside of the reactor and stick partway into the top of the fuel assembly. If the reactor protection system actuates, the power is cut off to control rod drive mechanisms and the CRDMs drop by gravity into the reactor. Testing after each refueling verifies that the rods will insert within a design time period (about 2-3 seconds). A larger picture (273K) of a Westinghouse pressurized water reactor. Information on the Reactor Cooling System or Fuel Assembly.